Hello everyone! 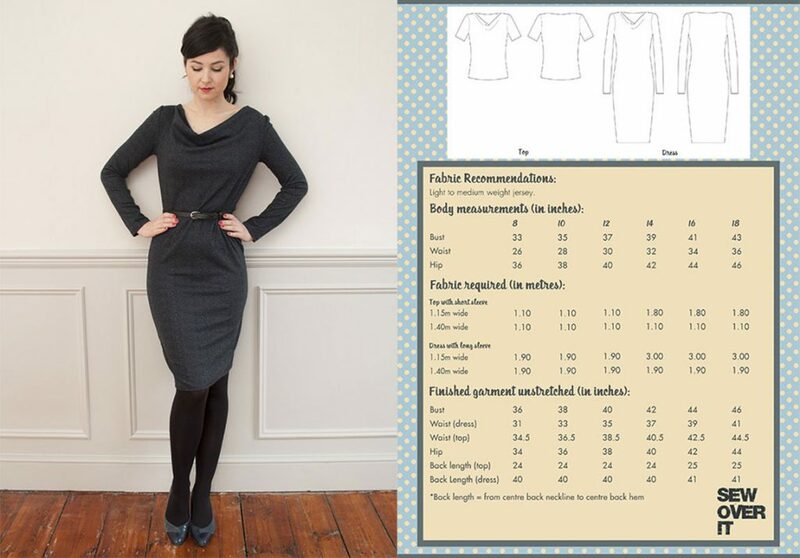 I’m back this week with another pattern review, this time about the SOI cowl neck dress. 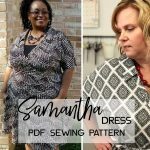 As I told you in my previous blog post (Thea dress pattern review), I’m currently working through my pattern stash to sew some new clothes for my wardrobe. I’ve recently had a big clearout and realized that I am still missing some comfortable clothes that I can wear while working from home. I’m now in a mission of either mending old makes that need a bit of care or sewing up some new ones. And jersey dresses are of course on the top of my list! I’ve had the Cowl Neck dress and top pattern in my stash since last year and I’d already made a red top with it as part of my Red, Black and White collection, which I presented in my first book. I do like this top, but because I squeezed it out of a leftover jersey, the sleeves had to be shorter. So I find that I’m not wearing it very often because I get cold very easily. The dress version was completely new to me, so it was a fun project to try. I found a think knit in my stash with a very interesting texture. The print on it looks like it’s weaved to the fabric instead of being printed, which makes it very unique and beautiful. And since it’s so thick, it’s perfect for this time of year. 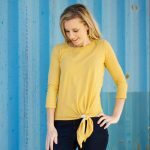 I cut out my usual size 10 for Sew Over It patterns. 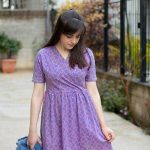 The cowl neck dress has only 3 pattern pieces, the front, the back and the sleeves, which means it’s super quick to cut out and sew and doesn’t require a lot of fabric. Although it is a very easy make, I followed the instructions to see how they were written. 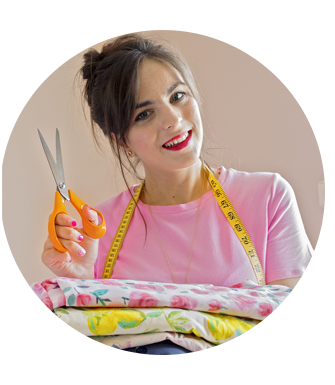 Since I launched my own pattern company, it is a pet peeve of mine to look at how the other companies do things in more detail. I was a little bit surprised with some of the steps. For example, I usually insert sleeves on knit garments on the flat, but in this pattern they were inserting them like in a woven garment. This threw me off a bit and I’m not quite sure why they opted for that method. In the end, I decided to sew it my way. I would also like to see some things explained in more detail in the instructions, but other than that, they were ok. The cowl neck was not difficult to make. You simply turn the edge under and topstitch. Sew Over It recommend using a twin needle, but I used a wider zig zag stitch and it turned out fine. In regards to the fit, I had some minor issues. First of all, the shoulders were very wide for my body. I remembered afterwards that I had the same problem when I made the top version last year. I wouldn’t say I have particularly narrow shoulders and I didn’t think I would need an adjustment, so I didn’t amend my pattern piece beforehand. Instead, after sewing up the dress, I took the shoulders in by 1,5 cm (5/8″) to correct the fit. I also took in the dress by 2 cm (1″) on each side as I prefer wearing more close fitting garments. Other than these two changes, I didn’t alter anything else on the pattern. I could have shortened the dress a little bit, but I kind of like it longer. It gives it a more formal vibe but it’s still comfortable to wear around the house. Overall, I’m quite satisfied with this make. 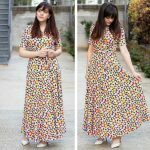 It is a versatile dress in my wardrobe, which can easily be styled up or down. I can wear it in the mornings and feel snuggly and cosy, but put together at the same time and I can also wear it with heels for a nice day out. Perfect combo! I hope you enjoyed my review. Let me know if you made this pattern before and what your thoughts are.